Your plumbing system is comprised of two parallel subsystems: the first brings fresh water into your house. The second, which removes wastewater from your house, is the drainage system. The latter in fact includes three components drain, waste and vent and is thus often referred to as the DWV system. Originating at the various fixtures, drain and waste lines tilt downwards and are pulled down by gravity. Their final destination is the main sewer line which, in turn, carries waste matter to a sewage facility or to a septic tank. 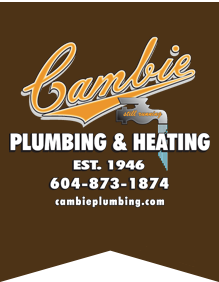 Cambie Plumbing & Heating Ltd. Can Check Pipes for Trouble Via Video. Video inspections enable our technicians to verify or identify any issues with pipes beneath your building using state of the art, high resolution cameras. Prior to the use of cameras, pipe inspections required demolition or excavation to determine the condition of lines. Video inspections are not just limited to the actual video. The tip of the camera also houses a radio beacon. This beacon enables us to locate the tip of the camera relative to ground. The information provided tells us the orientation of the piping as well as depth. This information enables us to pinpoint exactly where your system is having problems, minimizing costly excavations. Sometimes we can even avoid digging altogether.